Usually I only post video game related content here, so this one will be a little different. Recently, Prince passed away, and I was blown away at the world-wide response to his passing. Prince, growing up, was my favorite musician. I was born in 1970, thus all my teenage years was in the 1980’s. And in the 1980’s, even if you had wanted to, you could not have avoided Prince. I got into his music during the 1999 album. His sound was different, a blend of funk and rock. But different. But when Purple Rain was released, MAN, it was a game changer for me. It became, and still is, my all-time favorite album. I liked the movie as well, but the album was what did it for me. My favorite memory is laying in bed listening to that album on cassette. My parents house had one bathroom, which was only accessible through my bedroom. My parents room was right outside my room, so to listen to music when I was suppose to be asleep, I would have to wear a cheap pair of headphones. But they sucked, and produced no bass to speak of. I instead turned to my new Boombox with detachable speakers. I would remove the speakers from the boombox and position one on each side of my head. At Volume setting 1, you could not hear the music even on the other side of my bedroom, let alone in my parents room through a closed door. But positioning those speakers as I did, like giant headphones, volume 1 seemed VERY loud. Even better, the audio quality was head and shoulders better than the headphones. 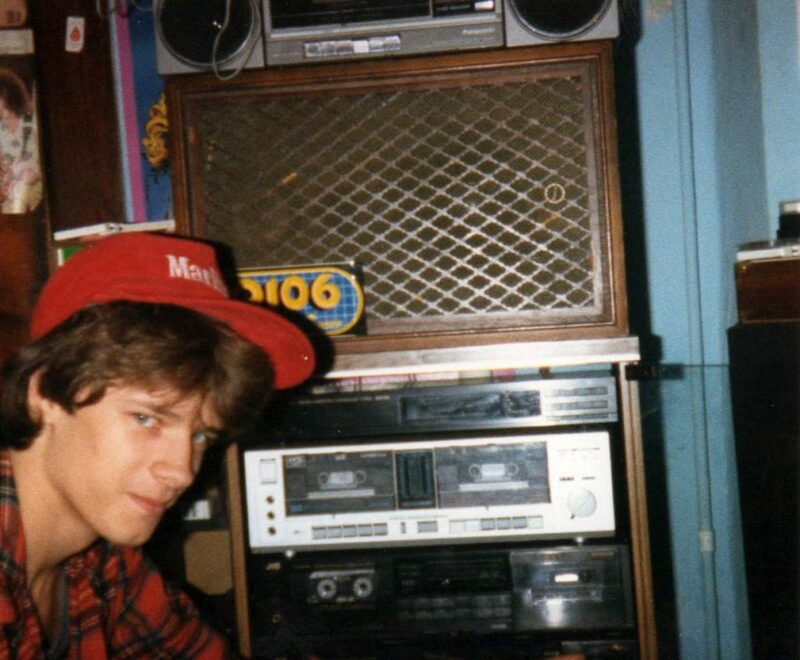 Yes, this is me back in the 1980’s, and yes, that Boombox up top is THE Boombox I am writing about. I would lay there, usually flipping the Purple Rain cassette over twice, before putting the speakers away and falling asleep. In my mind, laying in the dark with nothing but Baby I’m A Star, The Beautiful Ones, Computer Blue, and of course Purple Rain, I would imagine being Prince and playing those songs in concert. Of course, in my mind, I wasn’t Prince, and that album never came out. It was all my original music. I have fond memories of Around the World in a Day and Parade as well. Both excellent albums, and to me, almost as good as Purple Rain. By the time those two albums came out, I was in my 20s, and driving a car, so my memories for both those albums are of driving in whatever beat-up Chevy/Pontiac/Buick I had at the time, marveling at the depth of the music Prince was recording. 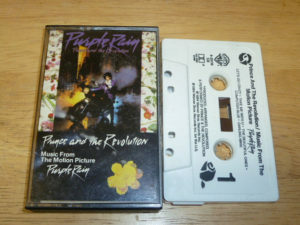 It would have been easy to release another album the likes of Purple Rain, but Prince went another route. He changed the sound, the style, the… everything. He was original, and would not even copy himself. My relationship with Prince was through his music. I never met the man, and from accounts I read about him, probably would not have gotten along very well with him if I had. I also never saw him perform live in concert, which is surprising if you knew how many concerts I went to between 1984 – 1994. But none of that mattered to me then, or now. Prince created some of the most important music to my life, along with Metallica and U2. Those, for me, were the big three. Prince will be missed, but I thank him for the music and memories. He made growing up so much better when I was a teenager. It must have been six to eight months already, because it’s once again time for me to review a LEGO game on the Mac from Feral Interactive. Feral has been one of the best Mac developers for many years now, and they are really good at porting games from other platforms over to the Mac so we, too, can get our game on! 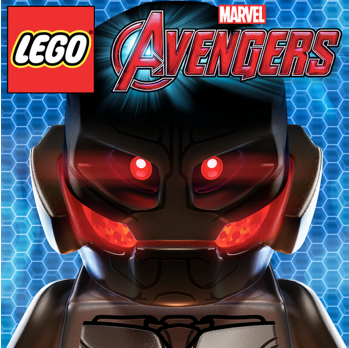 LEGO Marvel’s Avengers on the Mac is the same game I already own on the PS3. My kids love playing the game, so I have not had much opportunity to play it. Every time I try to play, my youngest will come in to the room, tell me how to get past a certain obstacle in the game, and I eventually just hand him the controller. So I was looking forward to playing this game on my Mac, where he would not just take over. I really liked LEGO Marvel’s Super Heroes, which I reviewed last summer, and many things in the new LEGO Marvel’s Avengers seem to have been lifted directly from that game. There are new missions, but it feels a little, well, cheating?, to simply reuse assets from an older game in the newer game. This is the first time I have seen this in a LEGO game, and I hope it’s not a trend that will continue. You play through the various Marvel movies, starting with the latest Avengers Age of Ultron movie, and then work back to some of the other movies. The first Marvel Super Heroes game was set in the comic book universe, where as this game is set in the movie universe. What’s the difference? Honestly, not a lot in playability or enjoyment, and they do a great job of creating some of the locations from the movies in this game. Two main issues with the game. One is that you can’t skip cut scenes during mission play through, and this game has unbearably long cut scenes. It’s like the developer was so proud of their little comedic takes on the Marvel movies that they are going to force you to watch each and every one of them, like it or not. The second issue is the length of many of the missions. The first LEGO video game,Star Wars, had easy to find and play through levels that took just enough time to be fun and progress the game. With Marvel’s Avengers, the typical level is long, long, long. You think you are done with a level after playing for a half-hour, only to have to sit through yet another long cut scene, and boom! Right back to another part of the level. Sigh. There is such a thing as too much of a good thing. Still, this is all pretty much forgivable as the game itself sports hours and loads of fun gameplay. Many levels, as I stated above, are not-quite but pretty much lifted right from the earlier Marvel game. But with the variety of Marvel movies you get to play through, and the sheer number of levels, this, too, can be forgiven. Breaking stuff, building stuff, solving the (mostly simply) puzzles, which is what you do in all the LEGO video games, is the lay of the land here as well. It’s a decade-old winning formula, and you can tell that the people who make these games have perfected the formula. It works, it’s fun, and it even plays on a Mac that is five years old. The graphics look terrific, and the attention to detail is first-rate. LEGO Marvel’s Avengers may be a clumsy name, but it’s not a clumsy game to play. Tons of characters to unlock, great audio from the actual movies, and a first class Mac port to a newer game. What more could you want? I know you saw the In-App Purchases above, but don’t worry. Looty Dungeon is not one of those games that claims to be free, when in reality to do anything worthwhile you have to spend ten bucks “unlocking” something via an In-App Purchase. Looty Dungeon’s IAP is simply characters you may want to buy, although I think you can actually earn them all just by playing the game and earning the in-game currency. Looty Dungeon takes its visual cue from the 8-bit retro craze that seems to be infecting the App store the last few years. (I think Minecraft is to blame, but I don’t know for sure.) Many games that use 8-bit retro graphics are not much to play, and the look and feel is really the only draw. Not so with Looty Dungeon. This is a fun, pick up and play game that will probably have you coming back time after time to get some more in-game coins so that you can buy another character. 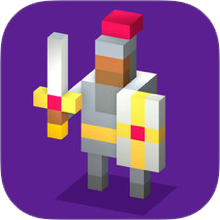 Unlike a game such a Crossy Road, where the characters may all look different, but they really don’t DO anything different, in Looty Dungeon the new characters actually have different abilities and health levels. You start off with a standard knight, who can both block and attack. As you collect more cons, by either picking them up in each room, completing tasks, or watching some advertising video, you can then begin to “buy” or unlock different characters. These characters, such as the Mage, can do different things. In the case of the Mage, he tosses out goo (a spell?) that will kill the bad guys. Some have weapons that go farther. Some shoot arrows. There is a lot of variety here. Looty Dungeon starts you off in one room, and you simply tap the screen to move forward. You swipe left, right, and back to move in those directions. Each room has a square, and you move from one square to the next. Each room also has some sort of peril that you have to overcome to open the door to the next room. (Thus there is no beating the game, you just go as long as you can before you die and start over) In one room, you may have to kill a bat, or a monster. In others, you have to beat a big boss, which may take up to three hits to defeat. Attacking a bad buy is simply moving towards it with whatever weapon of choice your character is using. (Spear, sword, trap, etc.) As long as you attack first, you will usually kill the bad guy in one shot. However, some characters that don’t have a lot of power may require you to hit it twice. Or, in one instance I found, I could not damage a boss, and the only way to win that level was to lure him over floor spikes three times. If you attack and hit the bad guy, and it don’t die, move and hit it again! Did I mention the floor spikes? They are not hidden, but if you are standing on a square when they pop up, it will take a heart away from you. Your character only has two or three hearts, so if you get hit by a bad guy, or a floor spike, or some of the other peril in the room, you will die. The floor at the bottom of the screen also starts to fall away, forcing you to continuously move forward in the game. Stay in one spot too long, the floor drops away, and you’re dead. Looty Dungeon may sound a little complicated from this review, but the truth is it is not. It is easy to pick up, takes a short amount of time to master, and brings you back for more time after time to unlock new characters or get further in the dungeon that on your last play. It’s a lot of fun, and I think I enjoy it as much as my eight year old son does. While I have had a glitch-free experience with Looty Dungeon on both my iPhone 6 Plus and a couple different iPads, a few users have reported a few bugs. But in the two weeks since this game was released, there has already been two updates, so developer Taco Illuminati seems committed to keeping the game up to date. And fun. Did I mention it’s fun? Ever since I decided I wanted to buy a full-sized arcade machine, I saved a Craigslist search in my toolbar in Chrome and have, almost every day, clicked that button to see what’s out there. 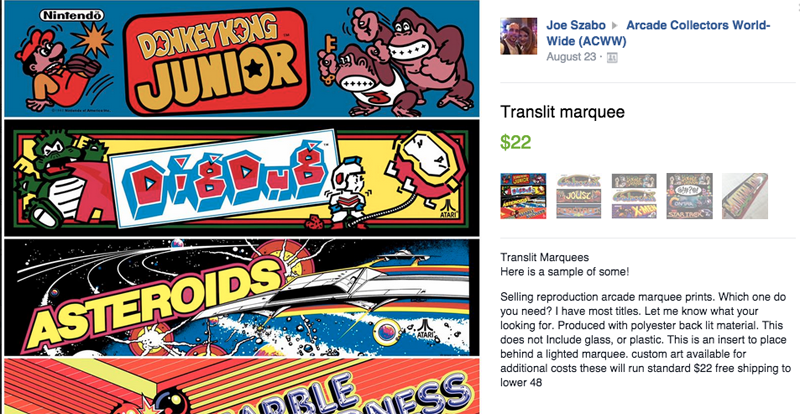 For the most part, there are a lot of arcade cabinets for sale, but most sellers are asking way more than the arcade cabinets are worth. Ms. Pac-Man, for instance, usually goes for over a grand. This cabinet was one of the most popular, and are not rare at all. Yes, for some reason, they are listed for a lot of money. No thanks! On September 24th (2015) I came across a Craigslist post that was for a Garage Sale in Grand Rapids, Michigan. That’s about an hour and a half drive for me, and our Ford Explorer needs a new radiator (ordered) so I didn’t trust taking it that far. 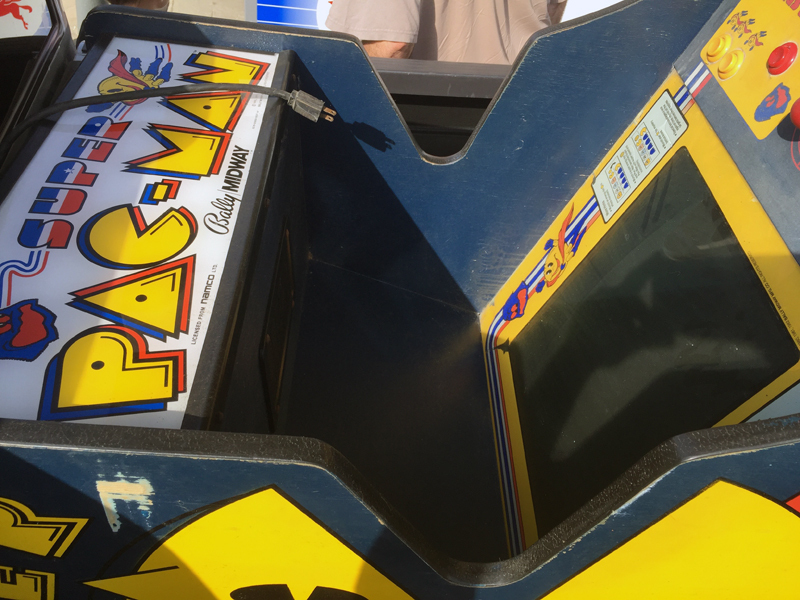 The ad listed a “not working pacman” game for sale, but no more information than that. 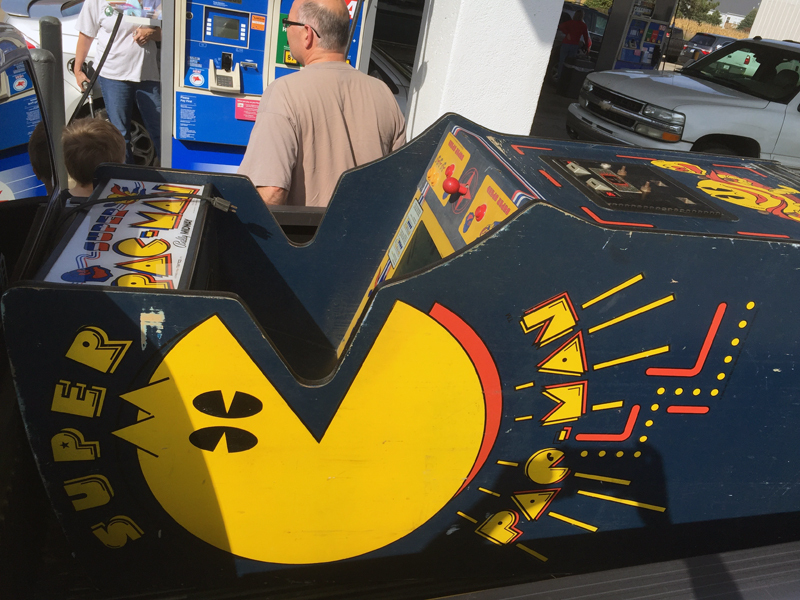 I emailed the seller, and he told he it was a Super Pac-Man and the screen stopped working a few years ago, but he could hear it playing, just no picture. The price was $50. I went back to the Craigslist ad, and noticed that I had neglected to check the pictures. Sure enough, there sat a Super Pac-Man game, and as you can see in the picture below, the cabinet looked to be in great condition. An arcade playing “blind” is pretty common. These are, after all, thirty to thirty-five year old monitors. I have watched enough restore videos to know that many times, the problem is usually one of two things: a cap-kit (Capacitor replacements) or a faulty power supply. For $50, I thought it was worth taking a chance. To be clear, I am not a huge fan of Super Pac-Man. It’s only an “okay” game. 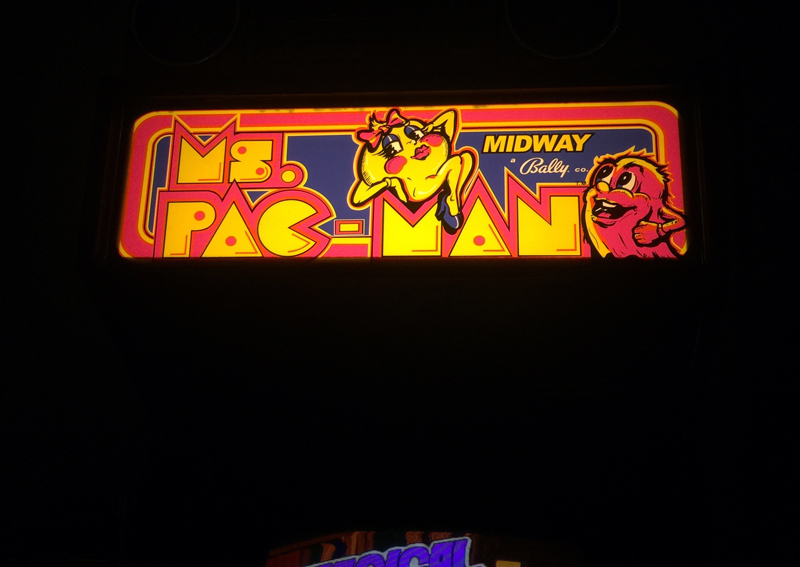 I much prefer the original Pac-Man or Ms. Pac-Man, by far. But again, $50! I enlisted the help of Chad Perry, one of my best friends. Chad has a truck! He agreed to help if I did buy the machines. 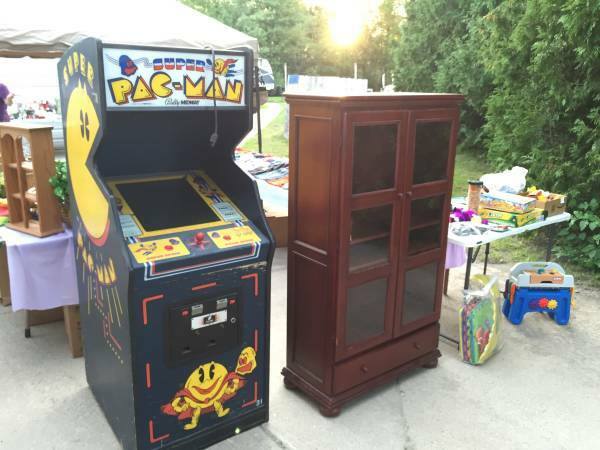 I contacted the seller again, and asked if I paid for the machine via PayPal, would he hold the cabinet for me. He said yes, so I paid and hoped I didn’t just get played and scammed out of $50. But with the pictures, and the address of the garage sale, I felt good about it. Saturday, September 26th, was the date for the pick-up. My wife already had plans to take the girls to baby shower, so that left my seven year-old son and me home alone. So while the girls all had a day out, so did Cole and I with Chad! One uneventful drive later, we get to the address. Sure enough, there is a garage sale going on. It was a nice house, with a big garage. But we did not see the arcade cabinet. Turns out, once it was sold (to me!) they had moved it into the garage. 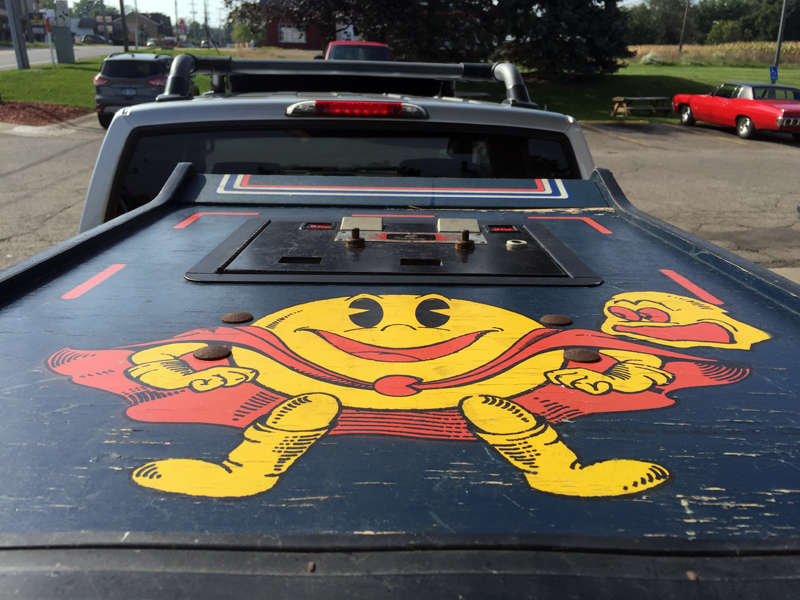 Chad was able to back his truck almost right to the door, and within two minutes, we had the Super Pac-Man loaded up and we hit the road! We did stop for gas at one point, so I took the below pictures of transporting the cabinet. And for those curious, yes, that is Chad pumping gas into the truck in one of the pictures. Once home, I lightly cleaned the machine up with some Fantastic and Magic Eraser. It still needs more cleaning, but for now, I just wanted to get it plugged in and see what it does. As advertised, the monitor is dead, but when you power it on, and coin it up, the game does play. You can hear the music and sounds just fine. The marquee also lights up. It’s playing blind. 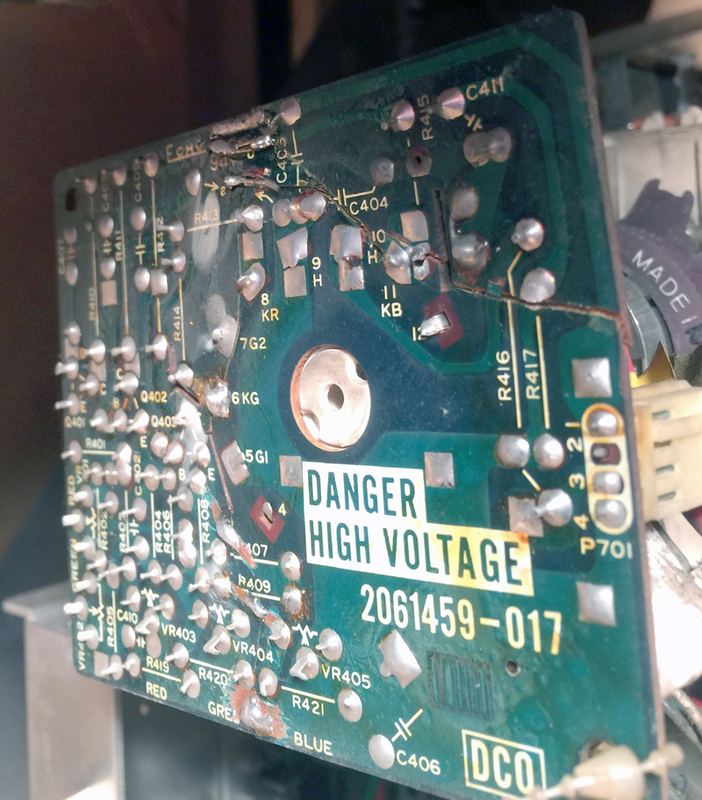 I checked some voltages coming off the power supply, and everything checked out. 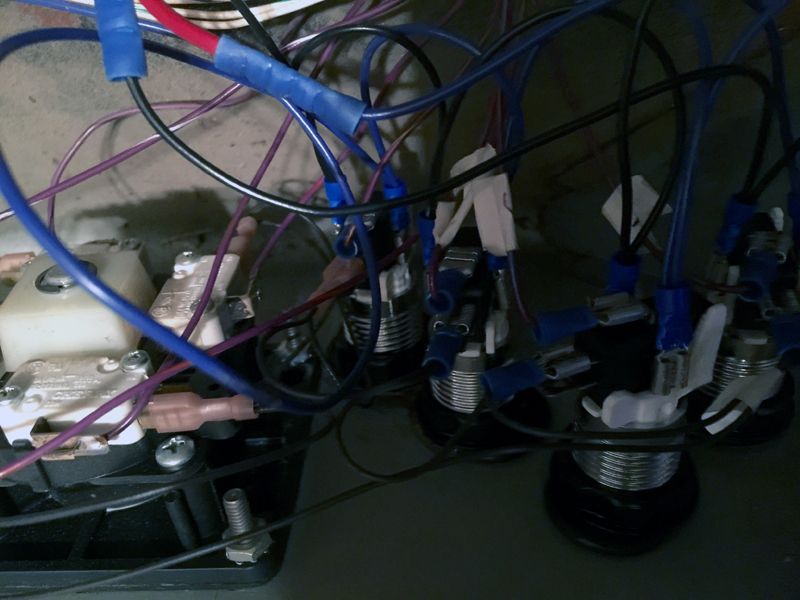 I also replaced all the fuses. Still, no joy from the monitor. 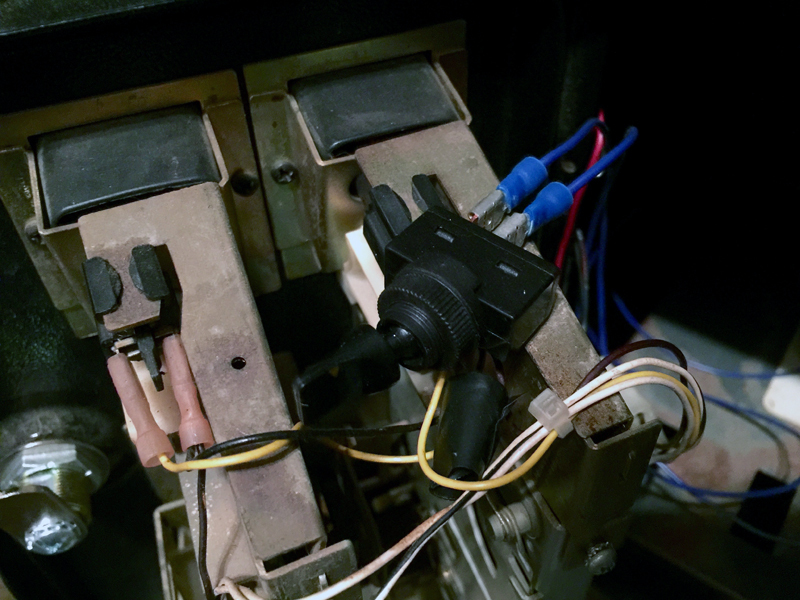 Many people on the Arcade Collectors World-Wide Facebook page suggests this is a fairly easy fix with some wire jumpers for the tracers, and hot-glue to hold it together. I may eventually solder it up, but another user informed me he had an extra neck board of this model, so I now have that. The next step, when I have the time, will be to replace the broken neck board with this “good” one and see what happens. It’s not a long or tedious job, but I will have to discharge the monitor. Heck, it’s taken me longer to write this post than the actual swap will take, but I wanted to get a post online about my latest addition first. 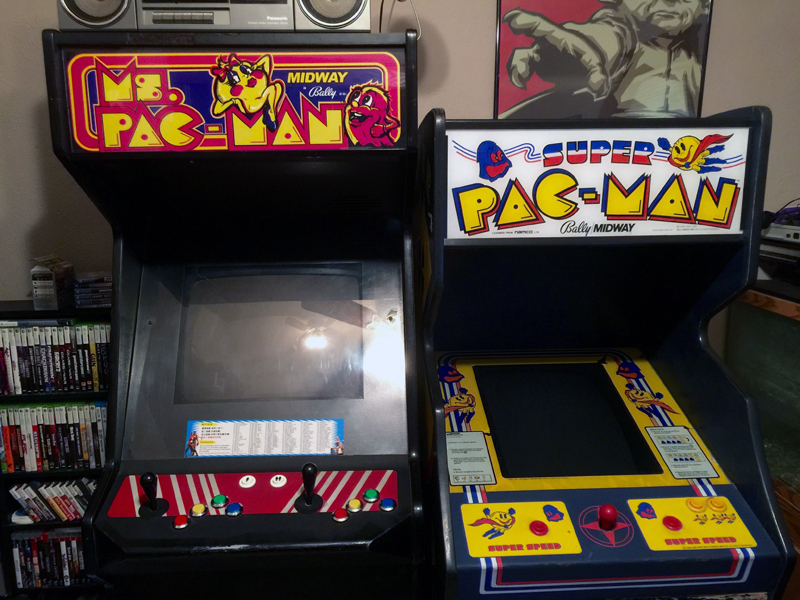 Here is a picture of the Super Pac-Man sitting next to my Neo Geo. Yes, I know that Neo is sporting the Ms. Pac Man marquee! But this does demonstrate how much smaller the Super Pac is next to the mammoth Neo Geo Dynamo cabinet. Lastly, I am torn. I know I want to keep the cabinet original, including the monitor, PCB, power supply, etc. But as I wrote above, Super Pac-Man is not a favorite of mine. So I may get a Super Pac-Man to Jamma adapter, and put in a 60-in-1 board. This will allow me to have more games in the cabinet without the need to remove or change any of the original parts. (And Super Pac-Man is actually on the 60-in-1) I would simply unplug the wiring harness from the Super Pac-Man PCB, plug that into a Jamma adapter, and plug the 60-in-1 board into that. 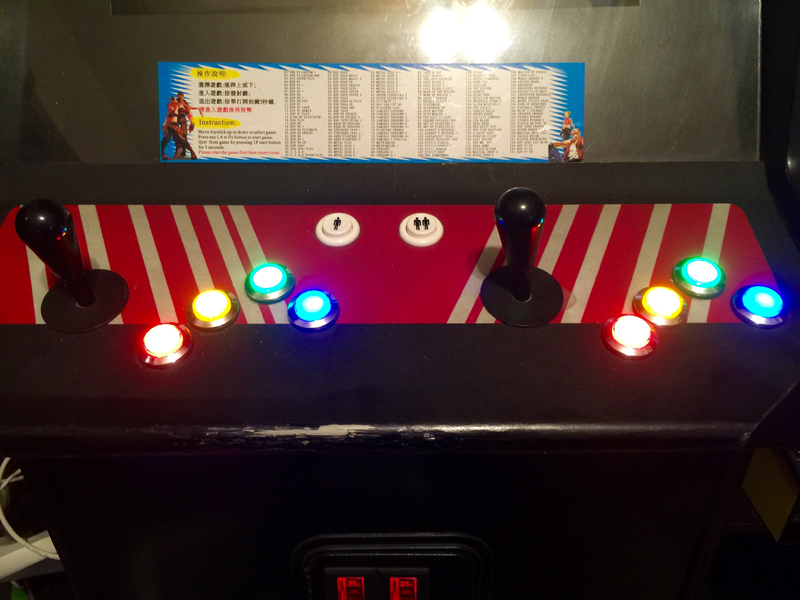 Presto, original arcade cabinet, with all the original internals, but with a nondestructive mod for more games! Oh, and the joystick really needs to be rebuilt. I think it works okay, but it’s old and could use some TLC. Check back soon to see which direction I go! You may think, what with all my posts about the mini-Arcades, that I have forgotten or abandoned the full-sized NeoGeo cabinet. Nothing could be further from the truth. In fact, before I even started to build the mini-Arcade machines (and I still have one left to go as I write this), I had updated the NeoGeo in four very significant ways. The fist was gameplay itself. While I really like the Bubble Bobble game that originally came with this NeoGeo, I wanted more variety. Maybe this is the fault of my MAME machine, or the fact that I currently have very limited space, but having such a large cabinet taking up that much space for a game I won’t play all that often seemed wasteful. Enter the 161-in-1 NeoGeo MVS Mulitgame Cartridge. The NeoGeo is a cartridge based video game system, much like an Atari 2600 or an NES. To play a different game, you just swap out the cartridge that is in there, and you’re good to go. But again, this is a large machine, and NeoGeo carts are not cheap. (They are about the size of a VHS tape) And to swap out a cartridge, I have to pull the arcade machines away from the wall (it’s heavy), unlock and open the back door, swap the games, and reverse the procedure. My solution was to use a cartridge that had multiple games build-in, in this case the NeoGeo MVS Mulitgame Cartridge. This cartridge has 161 games on it, pretty much the best of the best on the NeoGeo. While most of these games play just fine, they are technically not the REAL game, but rather emulation on a board in the cartridge. Still, they all look great and play great. I picked up this at Holland Computers. The price, as I write this, is $89.95. That’s about $0.56 a game! Well worth it. You can find the list of games included here. There are more fighting games than any other type, which for people who know NeoGeo should not be surprised. I like fighting games, but they are not my favorite. That said, there are some other real gems here, my favorites being Neo Bomberman, Neo Mr. Do!, Neo Drift Out, Metal Slug (all of them), and some others. All in all, I am glad I have this cartridge. 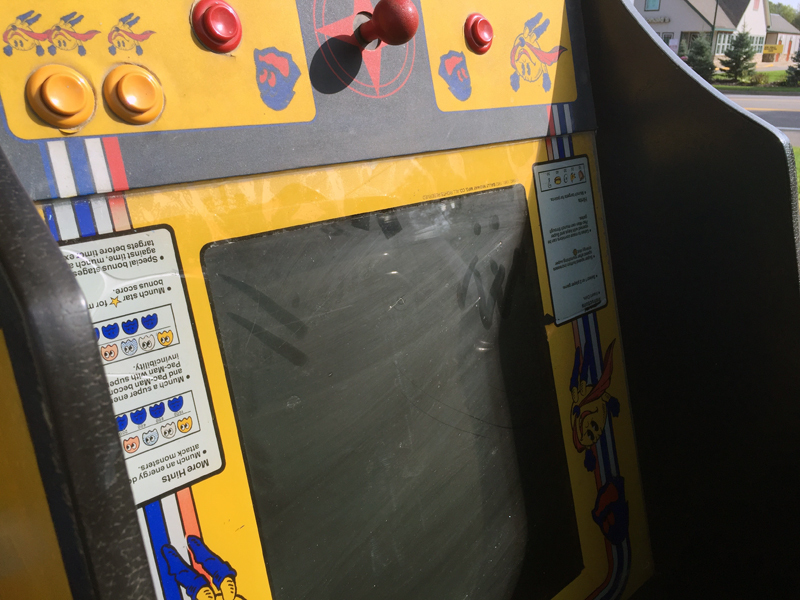 The original buttons on the arcade were fine. Nothing wrong with them. But what I really wanted were those buttons that would light up. After some research, I decided on getting the Ultralux LED Illuminated buttons from Ultimarc. Ultimarc is based in the U.K., and I am in the U.S., but I received my order within days of placing it. Fast shipping, great communication after the order, I could not have been happier. 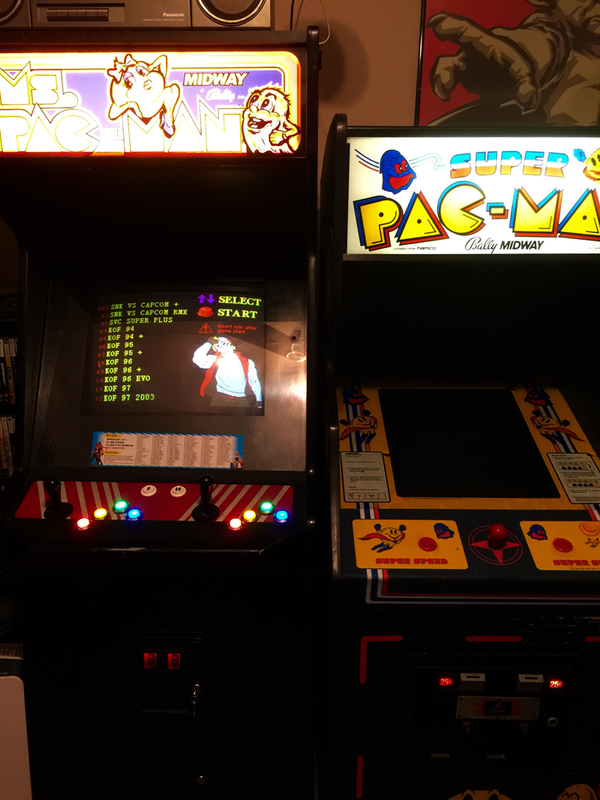 I have since ordered other items from Ultralux for both the mini-arcade and my MAME cabinet. The buttons are plastic with a faux-chrome finish. As you can see from the pictures, I purchased the Red, Yellow, Green, and Blue buttons. The buttons themselves are standard buttons, but with a Bayonet-fit LED holder. The NeoGeo has a switching power supply, and the LED buttons require 5v. 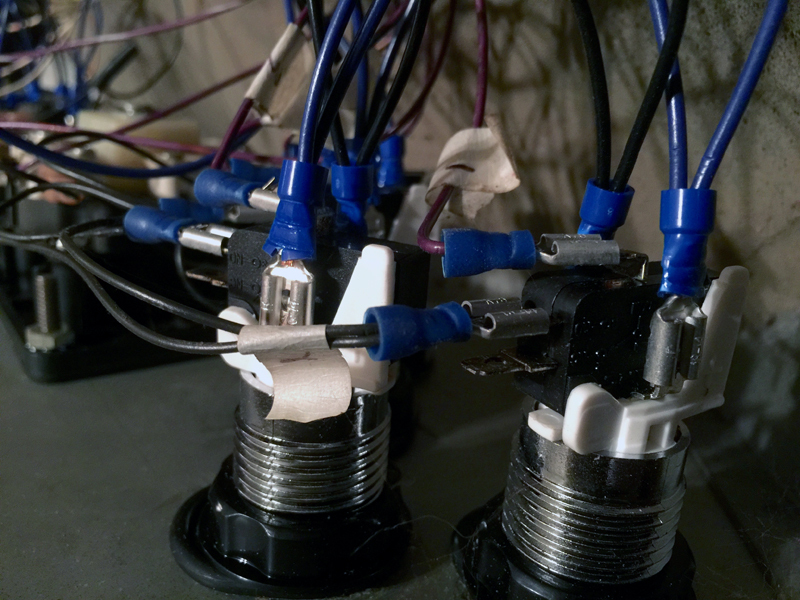 To connect them, I ran a wire from the 5+V on the Power Supply to the first of the LED holder, and then just jumped from one button to the next until all eight were connected. I then ran a common ground wire to all eight. When I turned on the arcade, all buttons sprang to life, and you can see the results. I think it looks awesome! 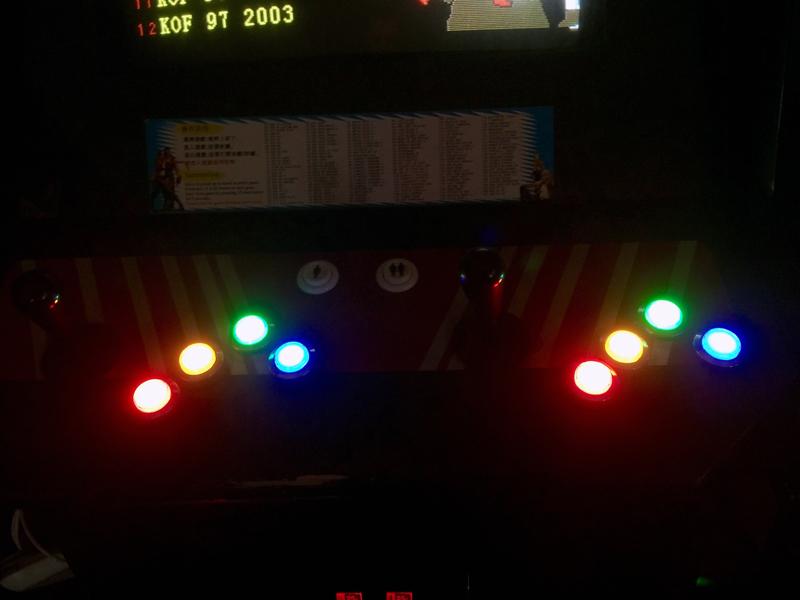 Oh, and I did not replace the Player 1 or 2 buttons. Maybe at some point in the future I will. Because the NeoGeo does not have a volume control, and it sits close to the living room where someone could be watching television, I wanted a way to mute the arcade. I did this with a very simply toggle switch. I just tied it into the speaker cable and the switch is sitting inside the coin door. I do eventually want to mount it somewhere, but I don’t really want to cut into the cabinet or put any screws in it if I can avoid it. So it’s behind the locked coin door, actually sitting atop the coin mech. It works fine, and I have had zero problems with it. I may also change it to a volume control, rather than a volume on/off switch. But for now, this works great. 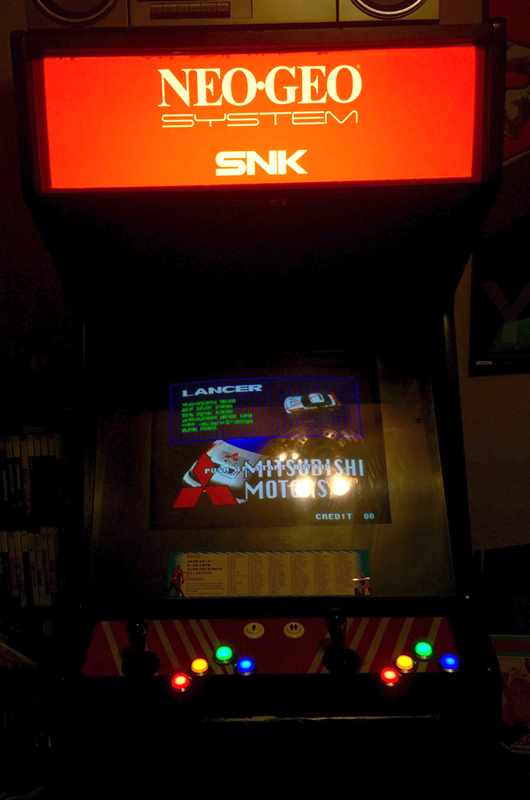 Then I got to thinking; while this is a NeoGeo, it is the only “real” arcade machine I currently have. 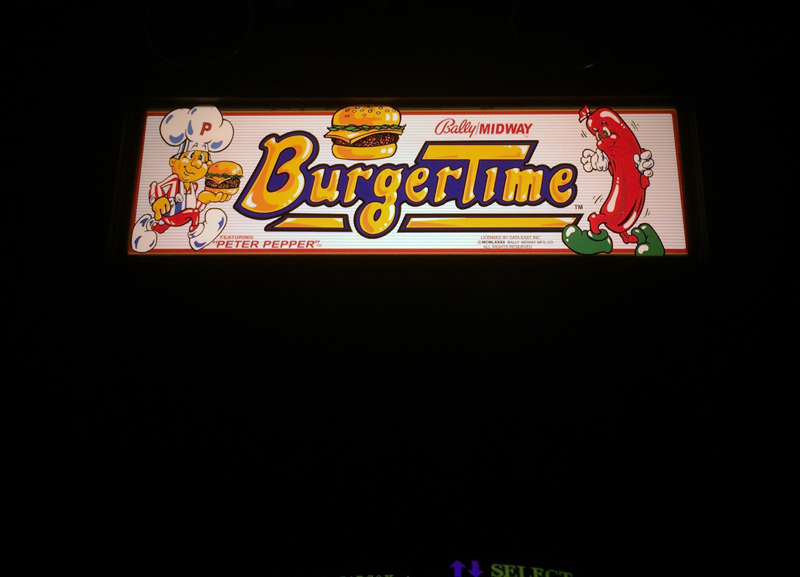 I would love to own more, especially two of my favorites, Ms. Pac-Man and BurgerTime., but if I can’t have them (yet), maybe I can at least FEEL like I have them. So I asked Joe if he could create those two marquee’s to fit in my- NeoGeo, and viola! I think they both look killer. No, this arcade machine does not play either of those games, but I don’t care. I can rotate the three marquees in and out as I see fit, and treat it as more a display than anything else when I feel like it. Screw it, it’s my game room! And I think (know) I will be contacting Joe again soon for a few more, specifically Pac-Man, Star Wars, and Donkey Kong. All in all, I really am happy to own the NeoGeo. There is more to do with it, such as side-art, new CP artwork, and a repaint eventually, but for now, I am very happy with the machine! Pac-Man iCade and Donkey Kong iCade Complete!